The TR-606 originally sold for £199, and you can pick one up second-hand for around £250. Throughout the history of modern music, a few manufacturers have become inextricably associated with certain types of products. Roland, for instance, offer a seemingly endless catalogue of tools for musicians, but will probably never escape the legacy of their standalone beatboxes. Initially only moderately successful, the TR-808 and TR-909 machines became the lynchpins on which entire genres were hung. So much ink has been spilled describing these wondrous devices that we're hesitant to bring them up as candidates for Blast From the Past, for fear of engendering little more than the cursory glance from even the most casual of electronic music dabblers. With that in mind, we've turned our attentions instead to the TR-606 Drumatix, a wicked little wonder, the worth of which is only now beginning to be recognised by the cognoscenti of all things analogue. Like its more famous siblings, the TR-606 produces its sounds using simple analogue circuitry. At first glance, you might mistake it for the TB-303 Bassline - and for good reason: the TR-606 was intended to be used in tandem with the 303 and could be synchronised to it via DIN-sync. Seven classic drum sounds (kick, snare, closed and open hats, a pair of toms and a cymbal) are produced using analogue synthesis (no samples here! ), primarily through the use of ringing oscillators and noise - the most common approach of the day. The sounds aren't editable - you can mix them and use the built-in sequencer's Accent to, well, accentuate them, but unless you're willing to crack open the plastic case, you're stuck with what Roland gives you. Fortunately, each and every sound is a gem. The snare snaps and cracks, the kick offers a satisfying thud, and the metallic hats sizzle. Its portability, price and punch put the TR-606 Drumatix in the hands of many big names. You can hear it on records from Sisters of Mercy, Orchestral Manoeuvres in the Dark, and Skinny Puppy, not to mention Autechre, Aphex Twin and Luke Vibert. While the 808 and 909 have been digitally recreated ad nauseam, the TR-606 has only more recently been cloned - most often as an included soundset in virtual machines that cover all three. Of course, pre-fab samples of the 606 are easily had as well. Here, D16 serves up the authentic sound of the original Roland Drumatix, with each of the seven drum sounds recreated accurately - all the thump, spit and sizzle translated electron by electron into ones and zeros. However, D16 Group have upped the ante by providing the ability to tweak the sounds in a manner similar to the 808 and 909. AudioRealism's mastery of analogue emulation is on display in this, its tribute to all things x0x. You get a superb sequencer and recreations of all three of the best Roland Drumcomputers. 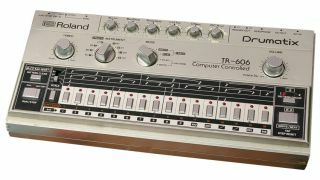 Sure, the 808 and 909 sounds are great, but the 606 bits are what really set it apart from the crowd. Free samples of the TR-606 Drumatix are pretty easy to come by, but free emulations of the instrument are as rare as hen's teeth. However, those on a budget can grab the free Tromine, a VST with all seven 606 sounds onboard. It was made in SynthEdit, so only Windows users need apply. It's 32-bit-only, too.